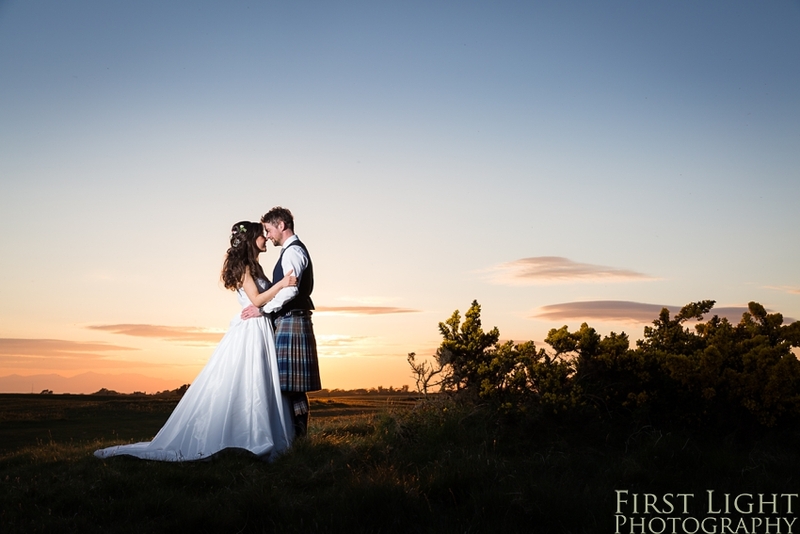 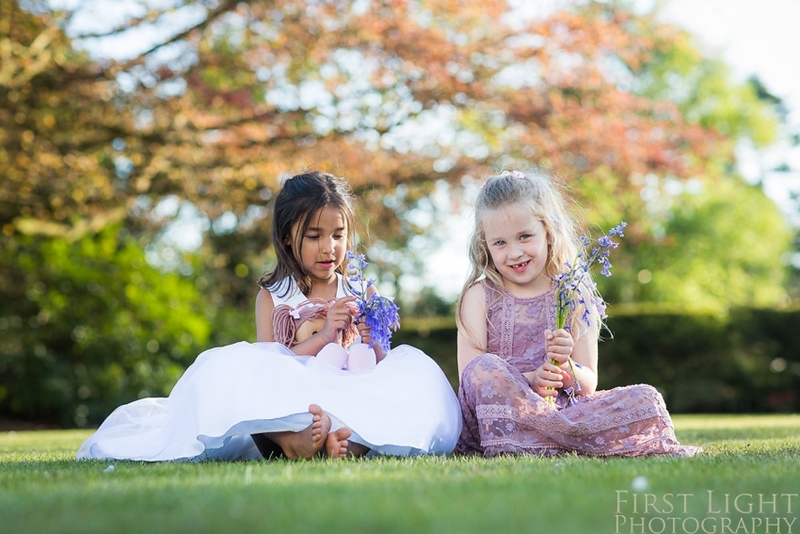 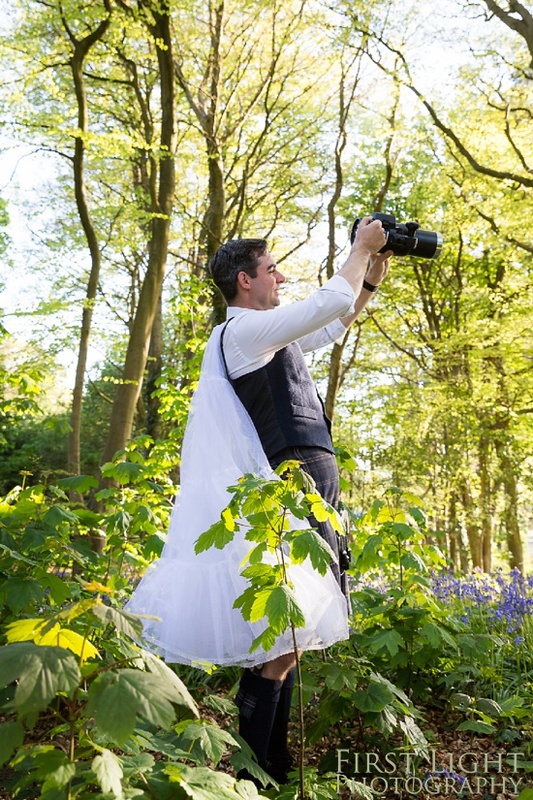 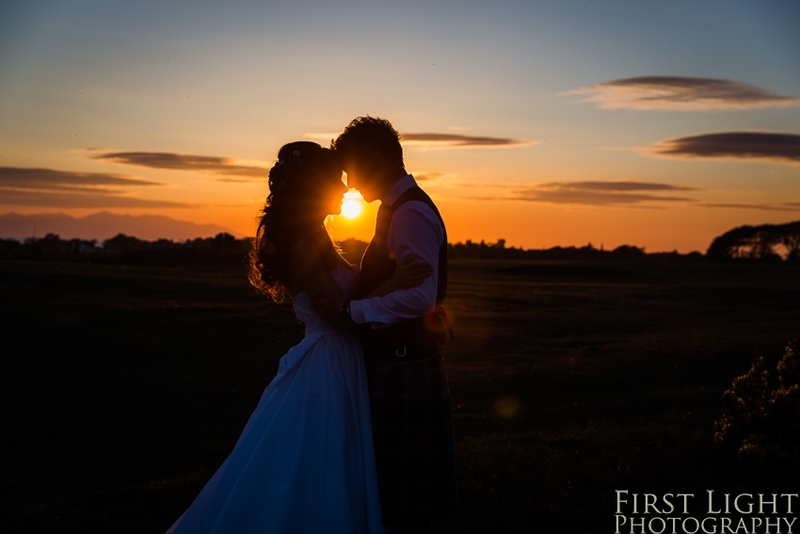 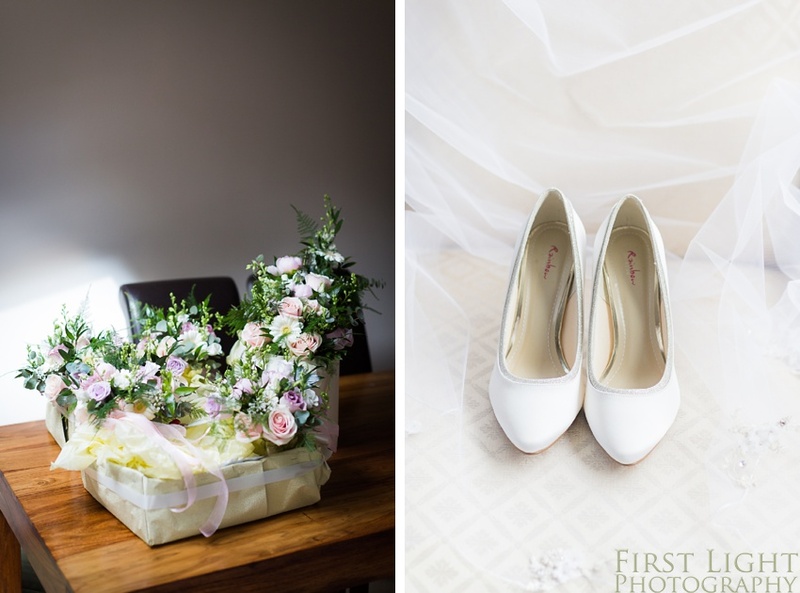 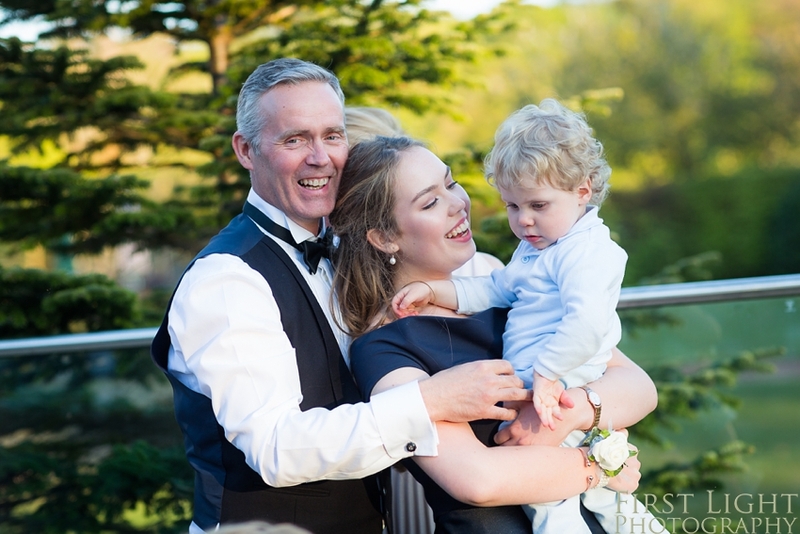 We absolutely love capturing a spring wedding, and when they involve beautiful blossom, sunshine and stunning sunsets what could be more perfect? 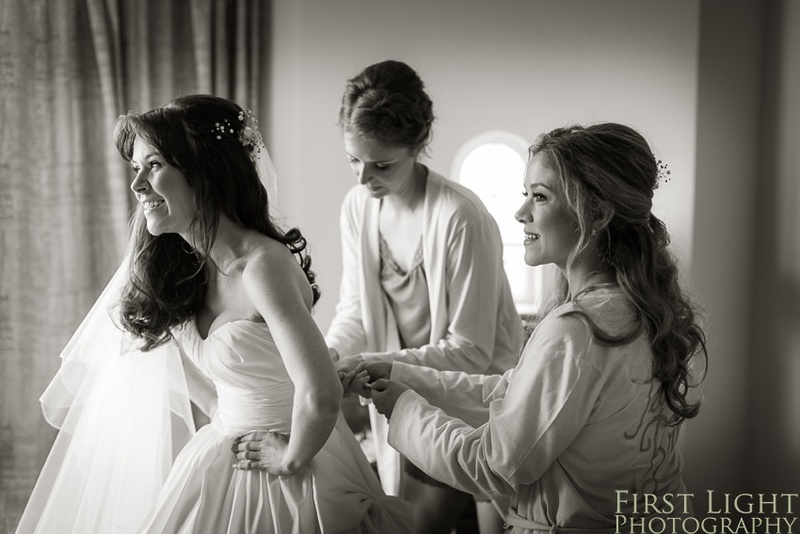 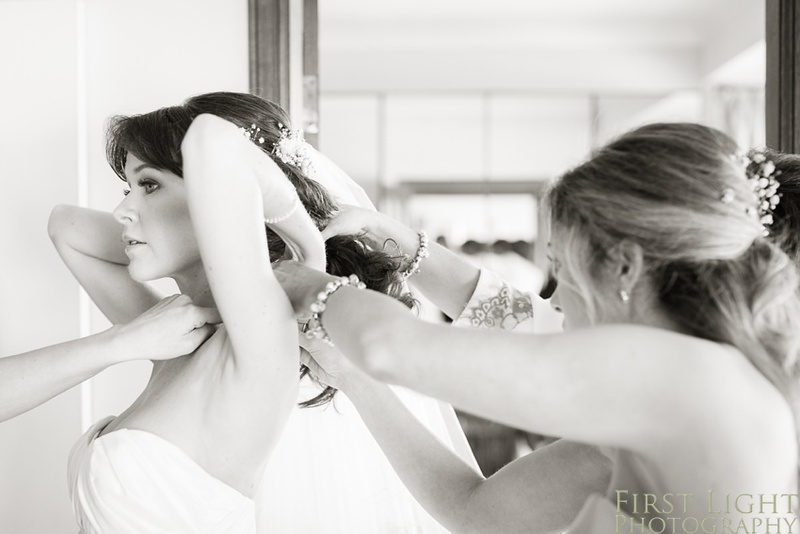 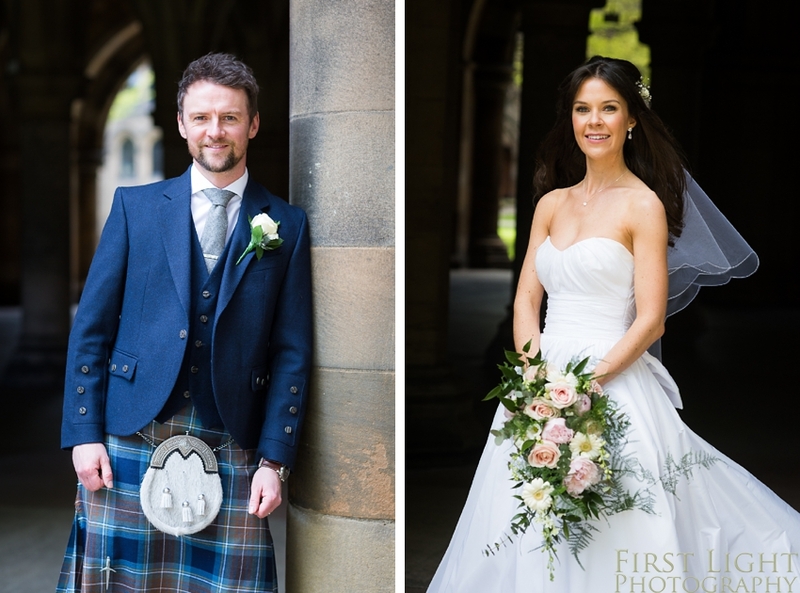 Samantha and Michael’s wedding day had all of these elements in abundance. 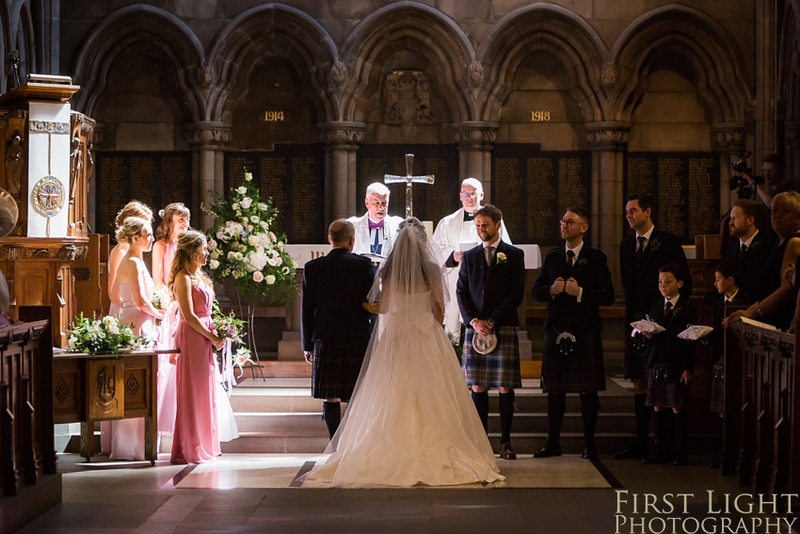 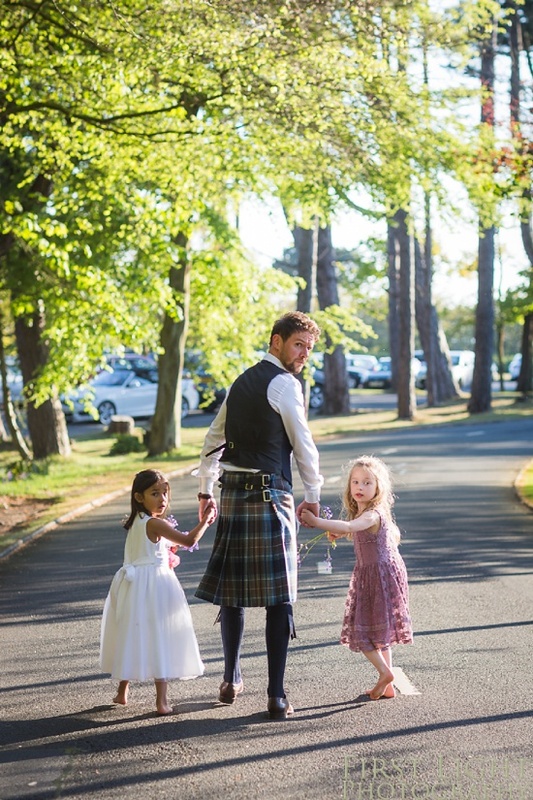 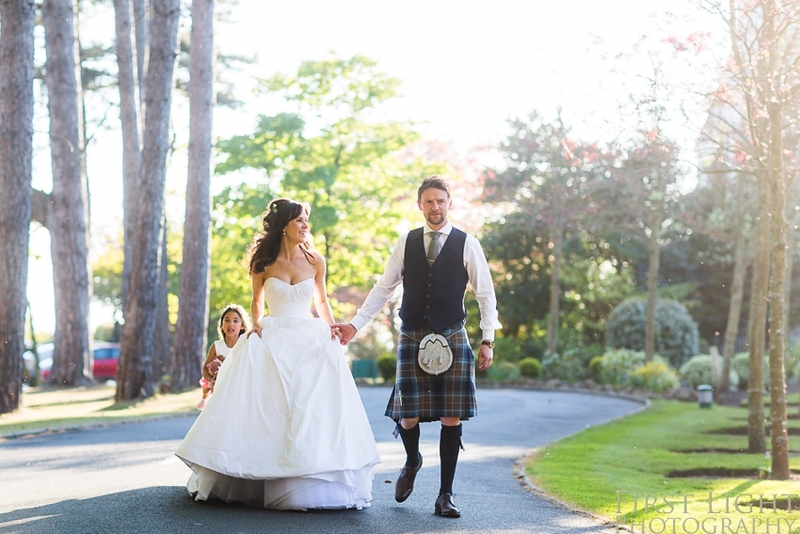 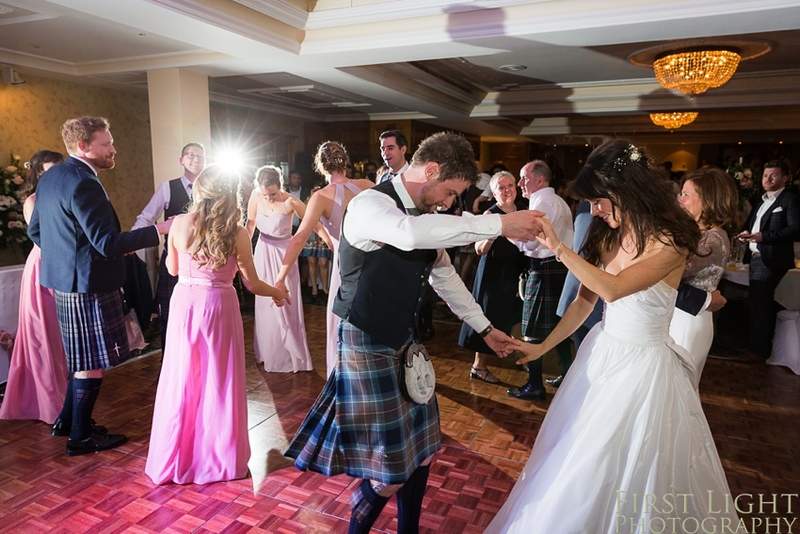 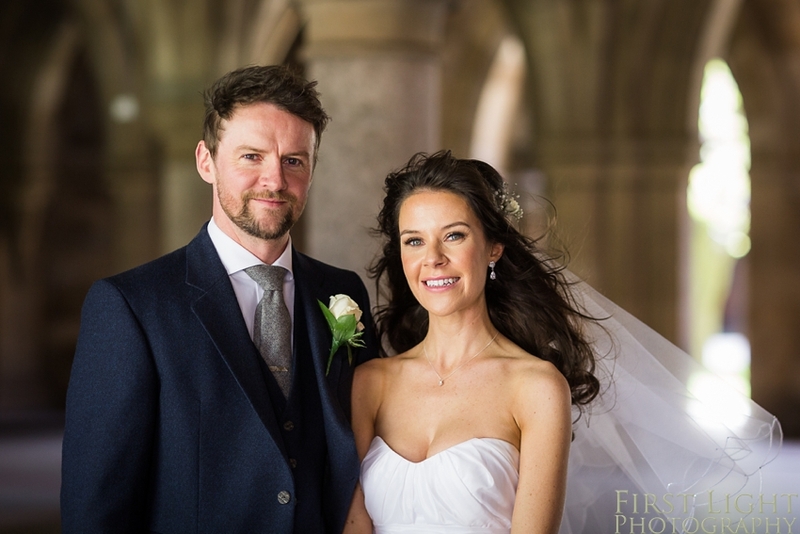 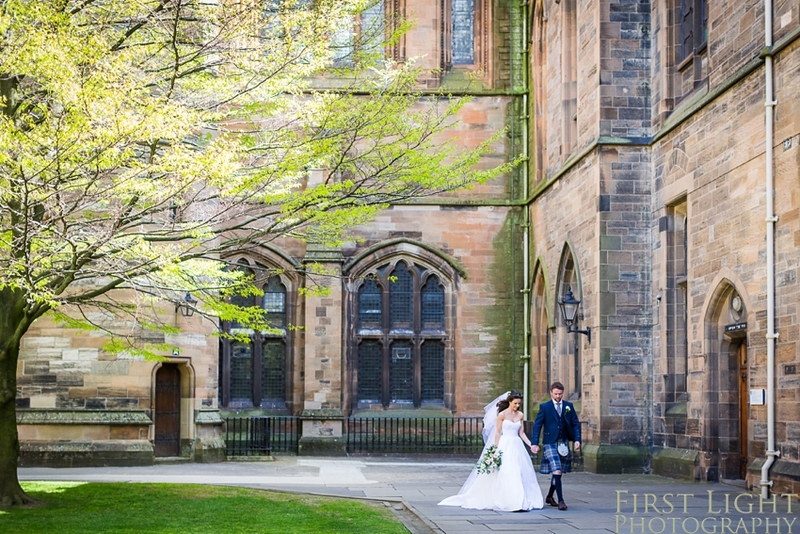 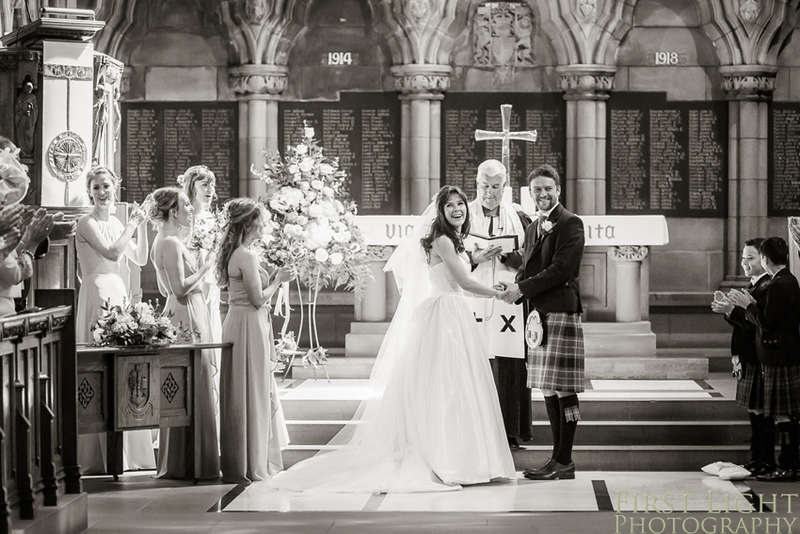 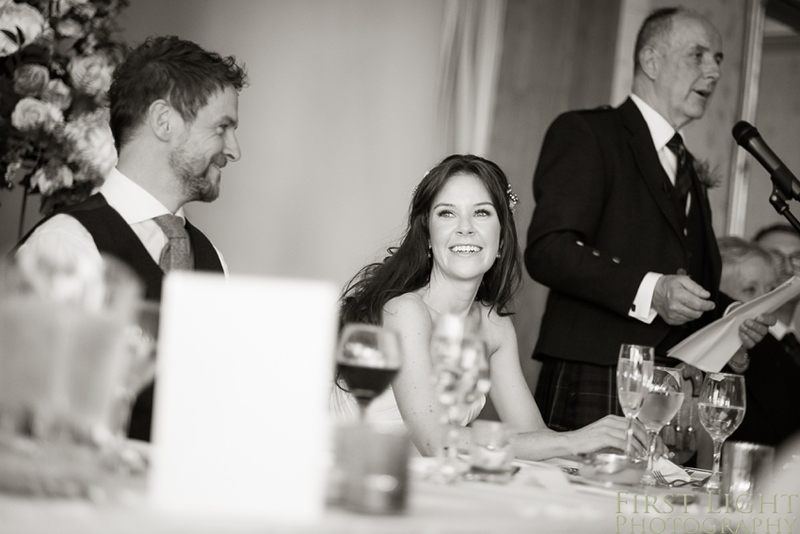 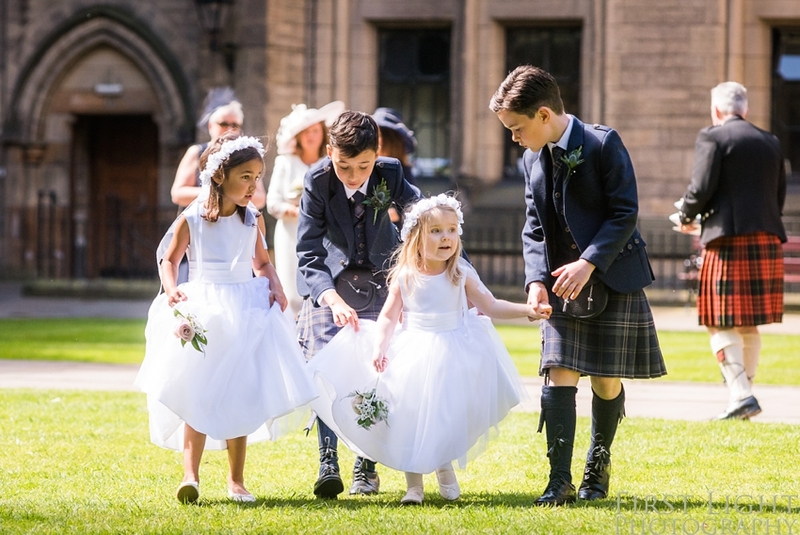 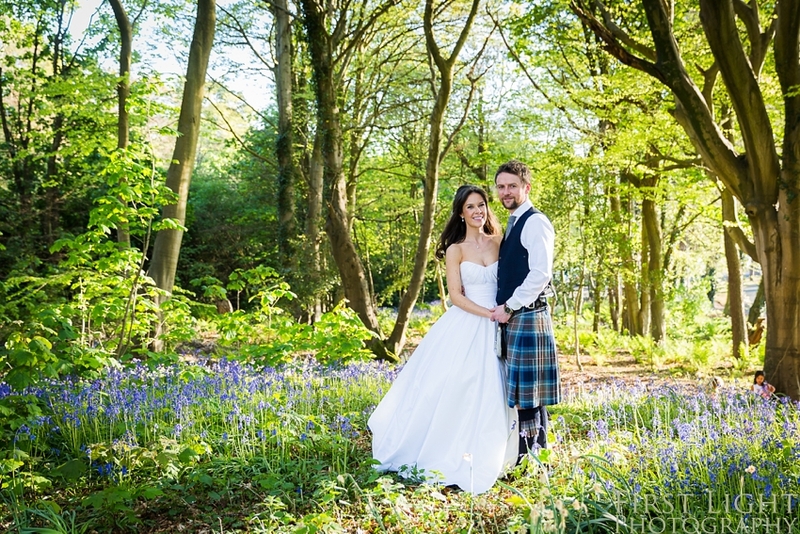 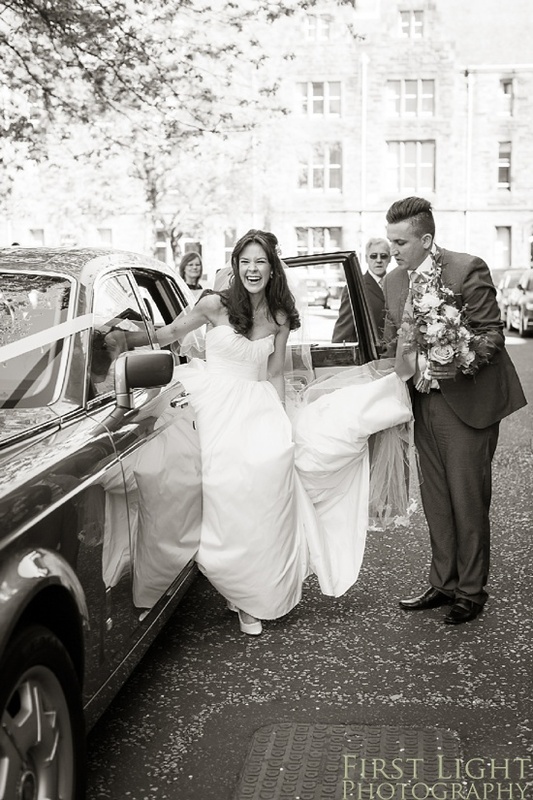 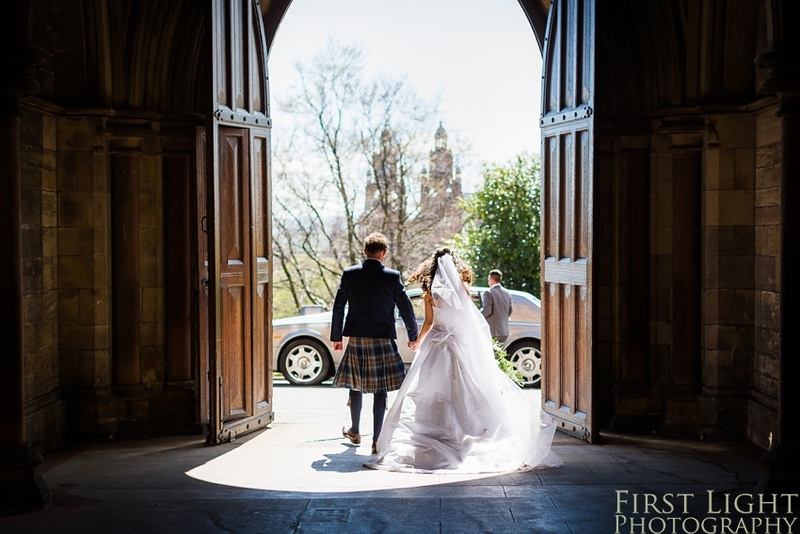 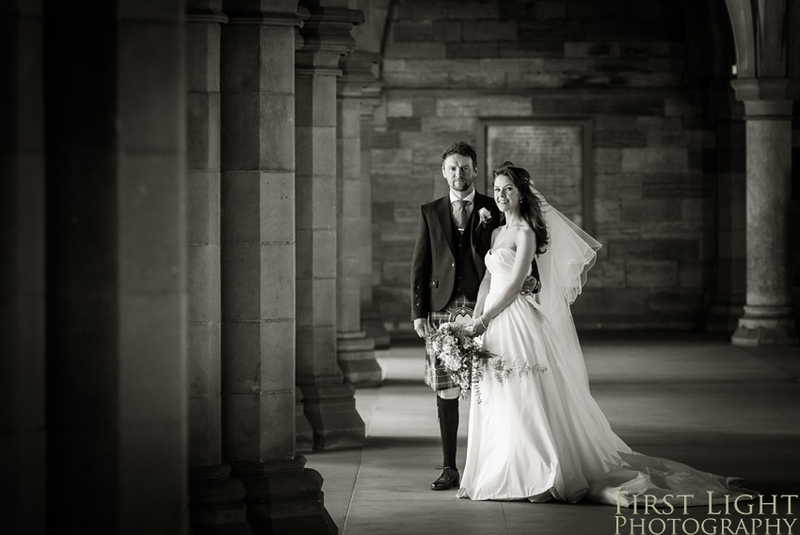 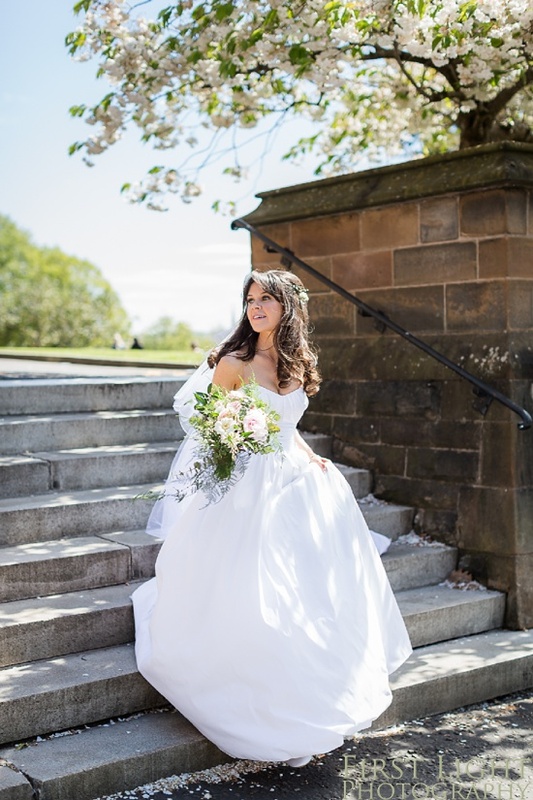 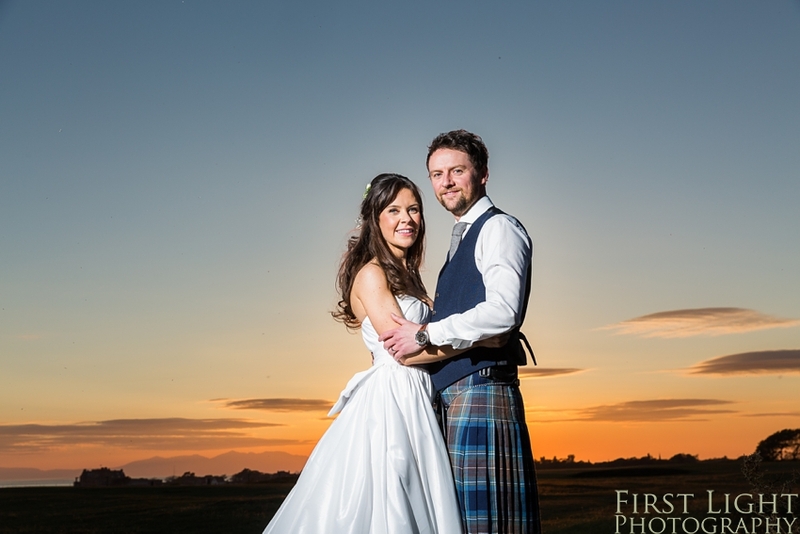 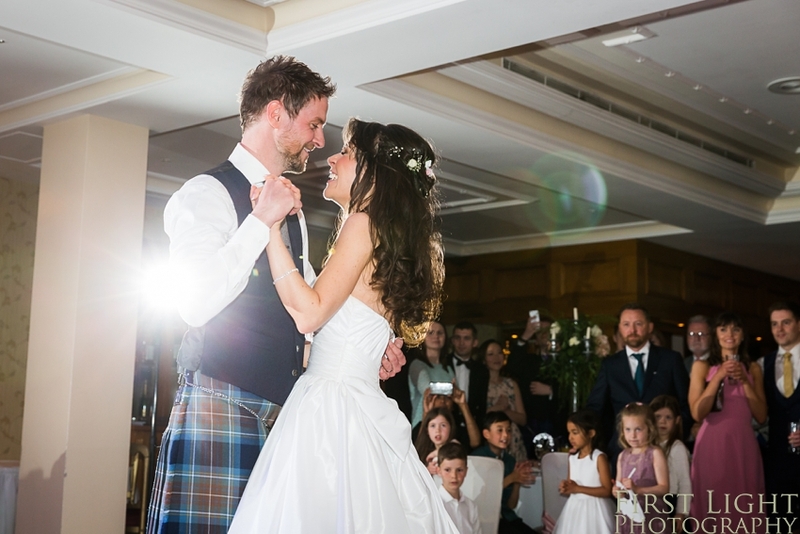 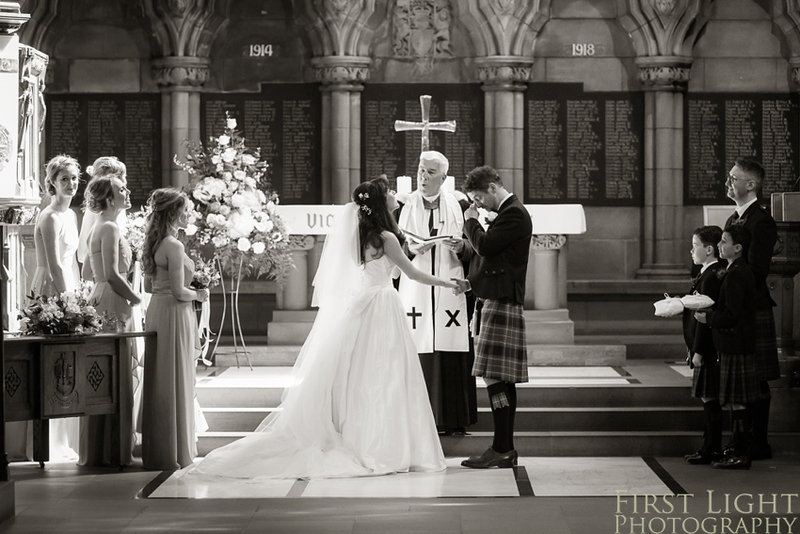 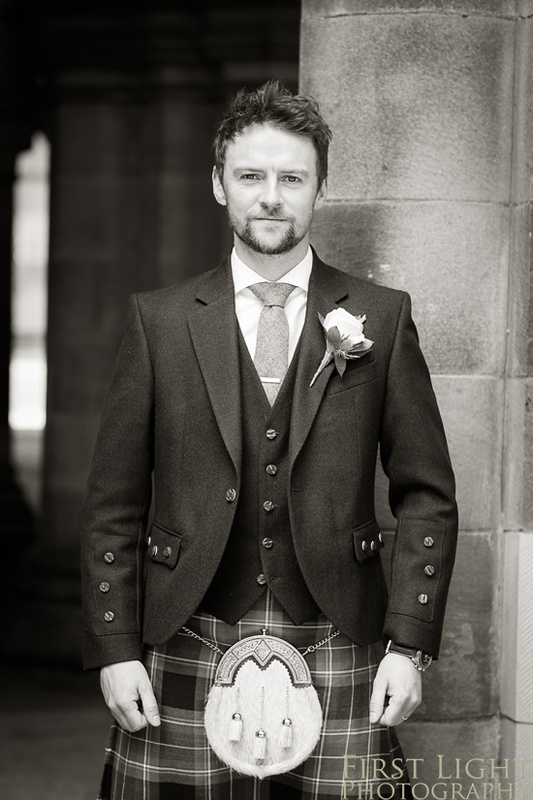 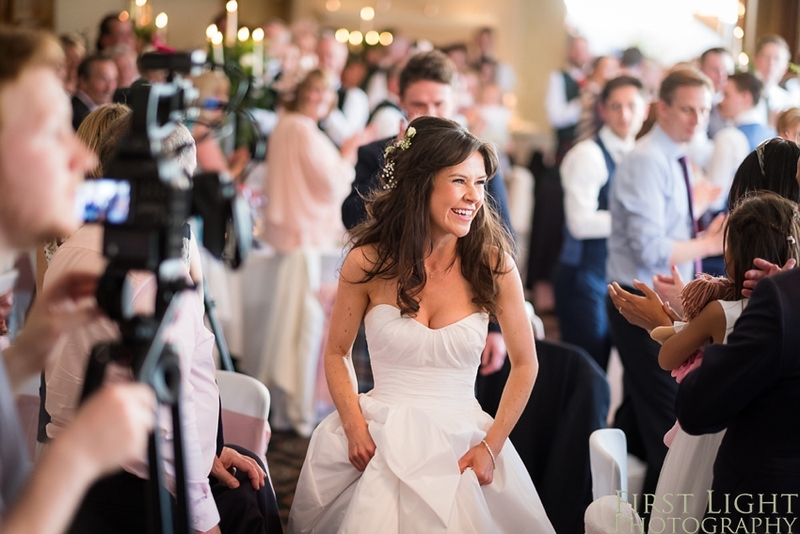 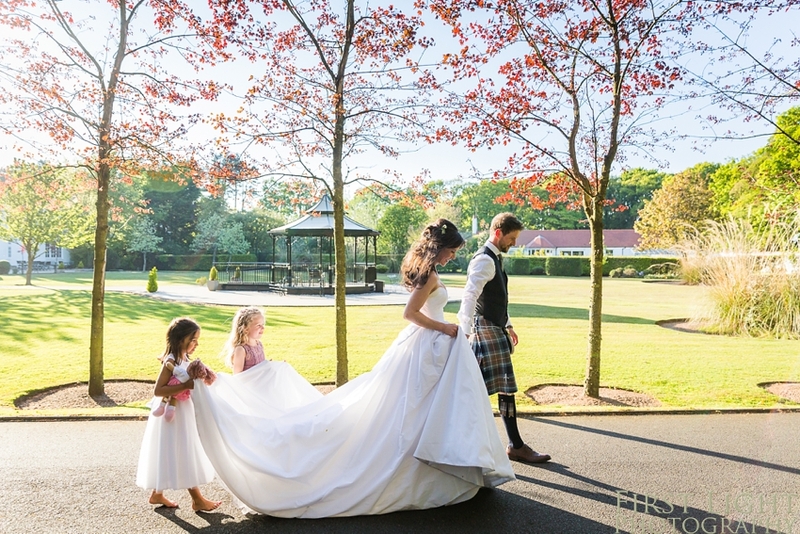 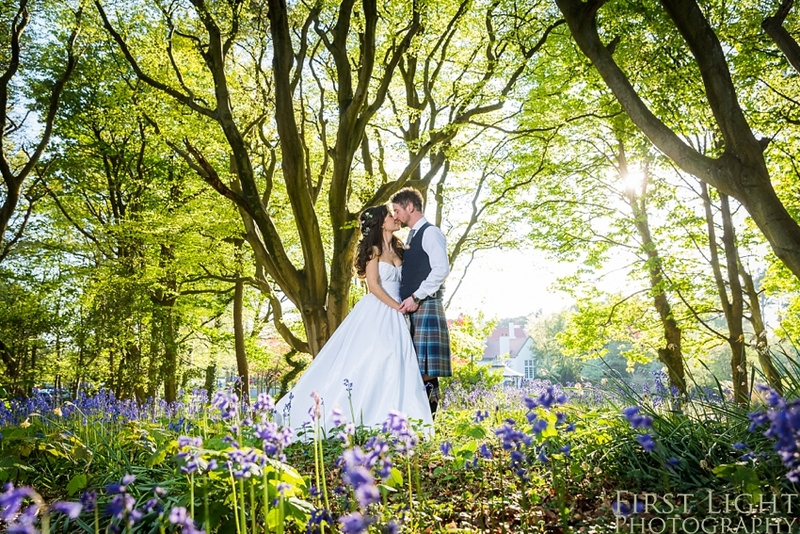 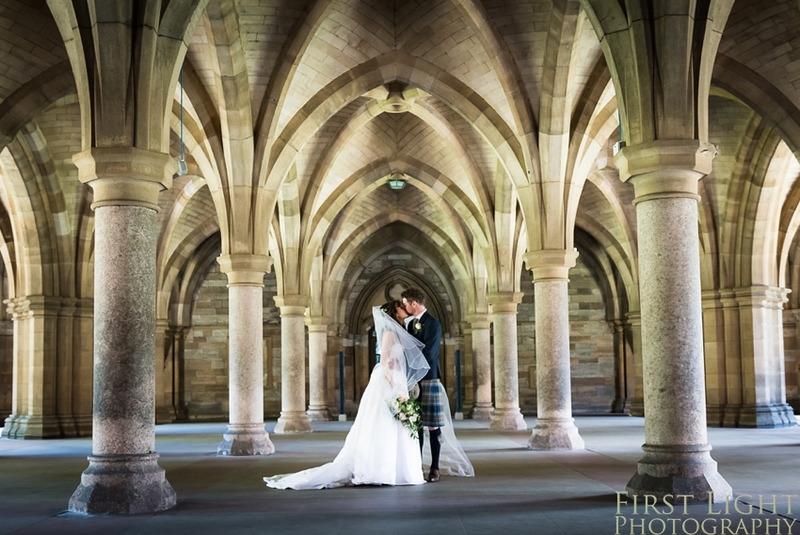 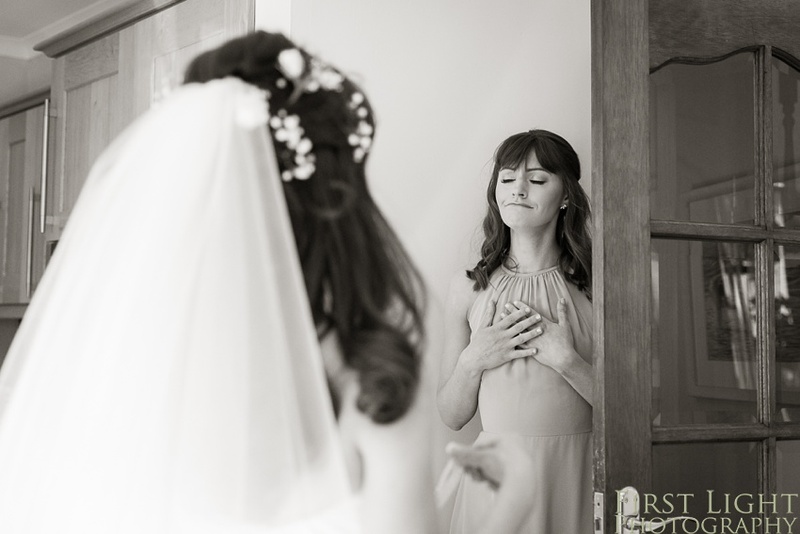 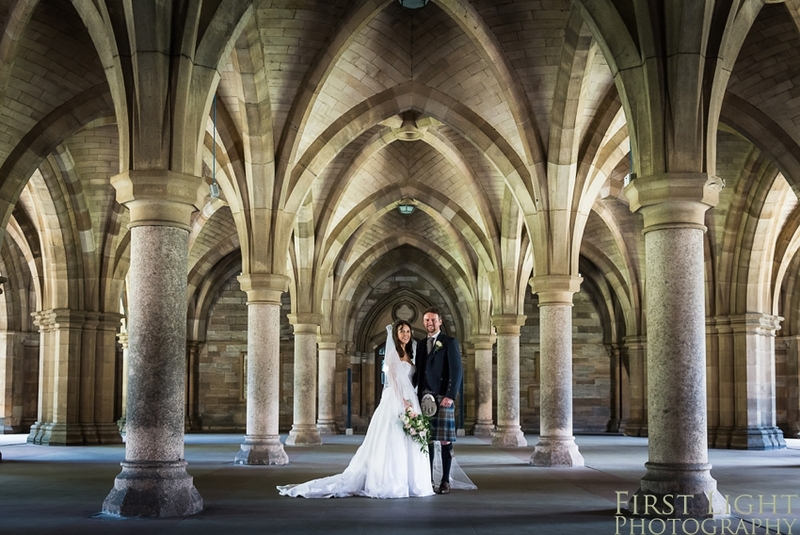 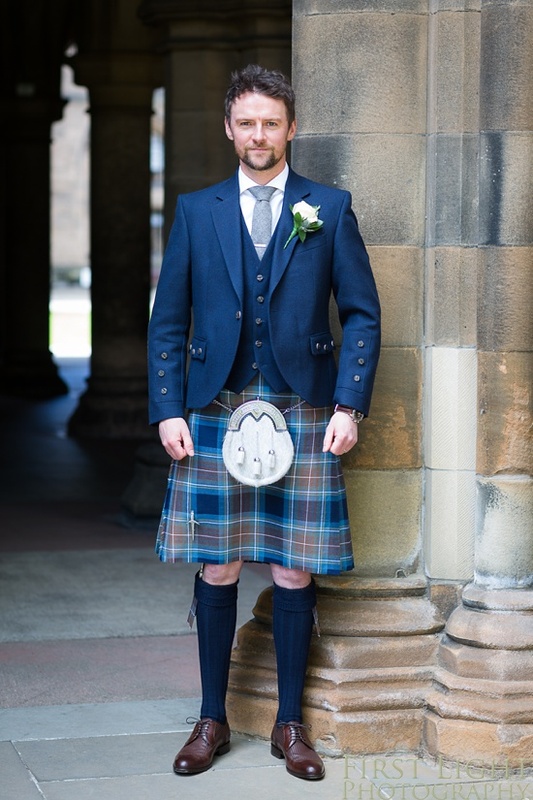 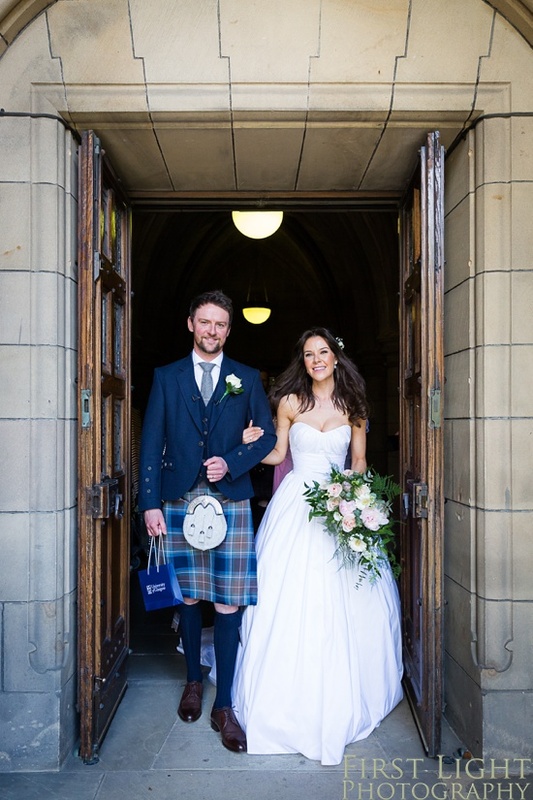 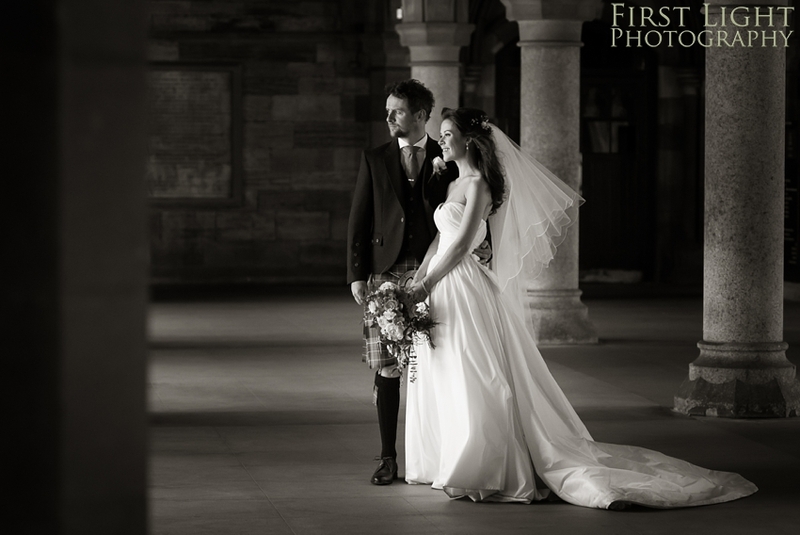 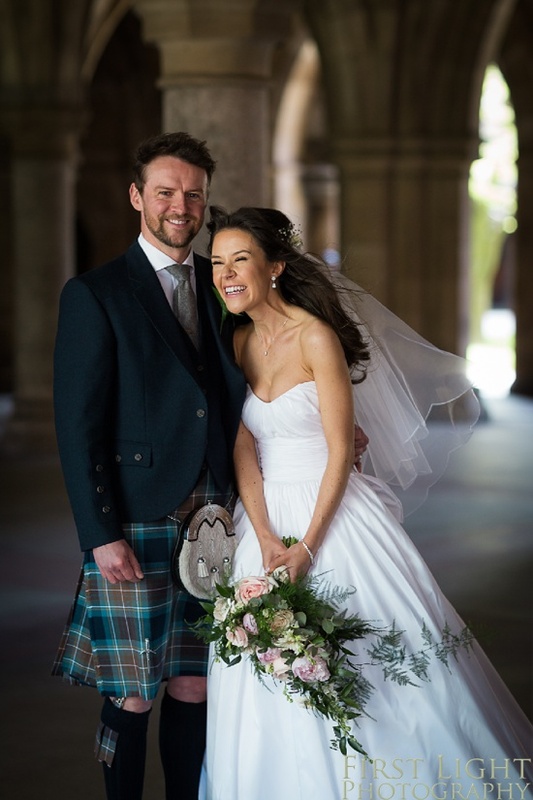 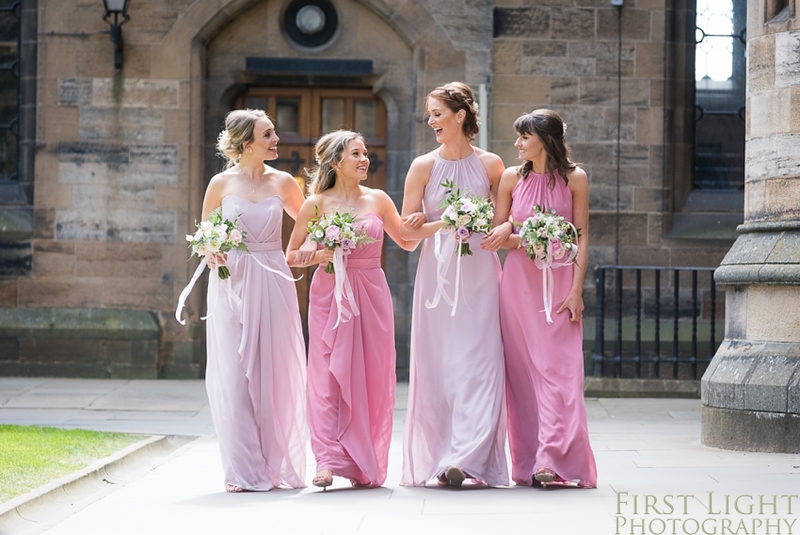 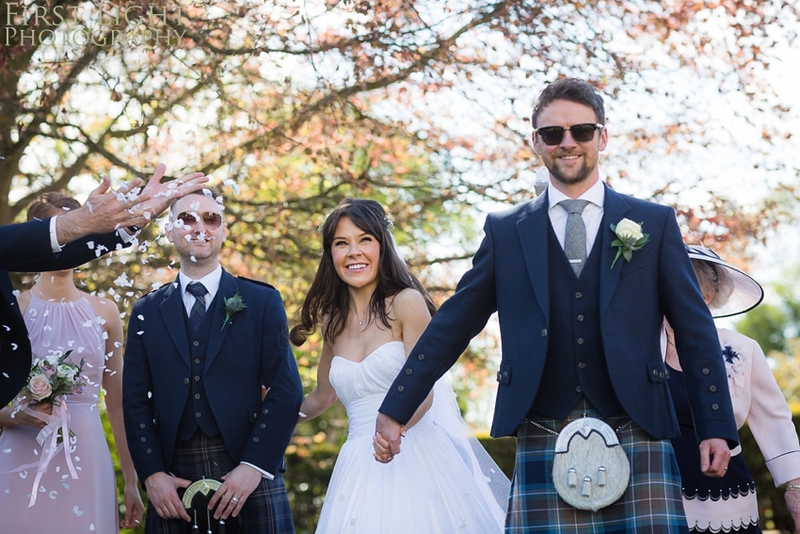 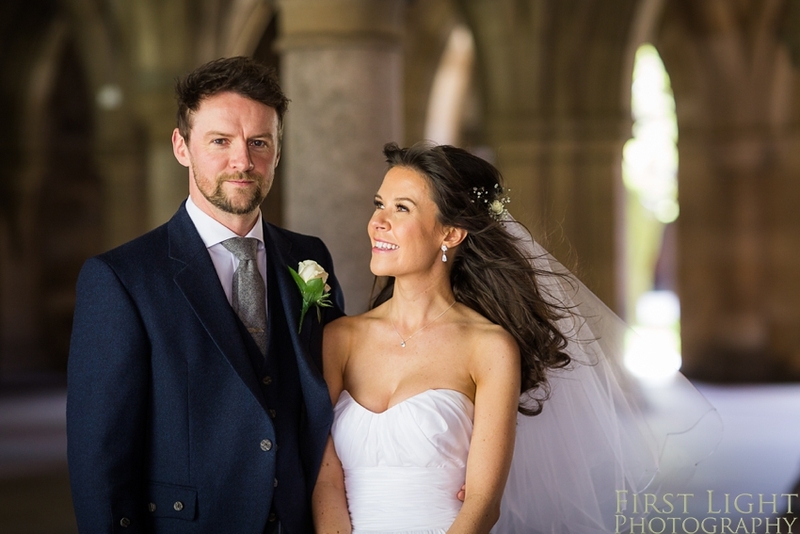 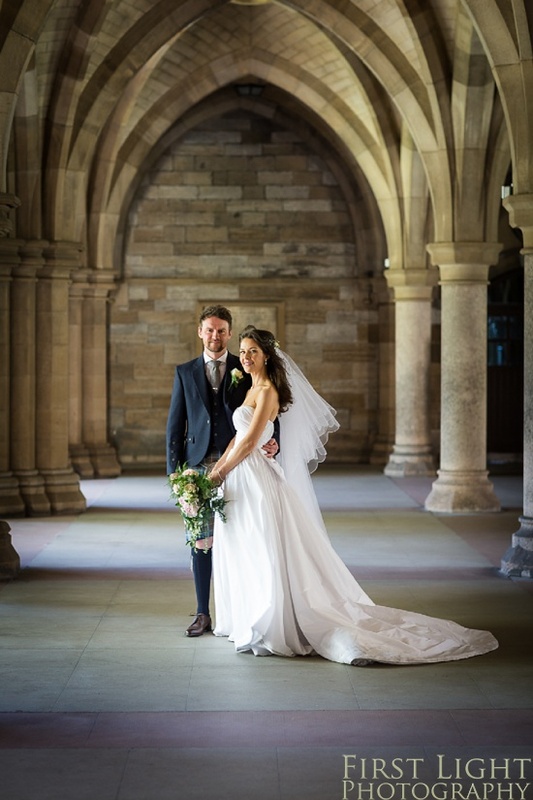 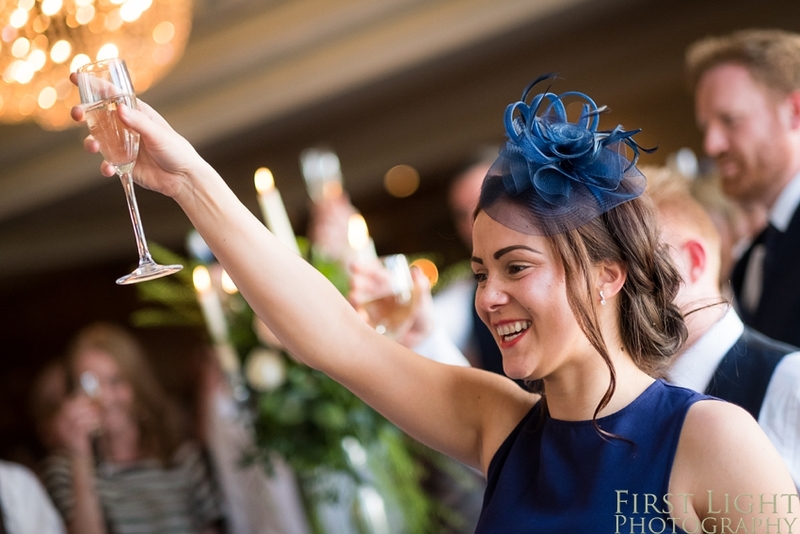 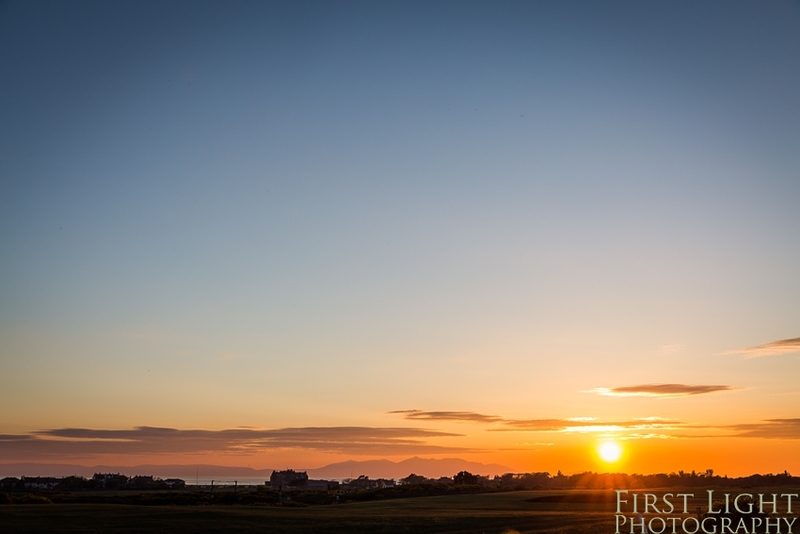 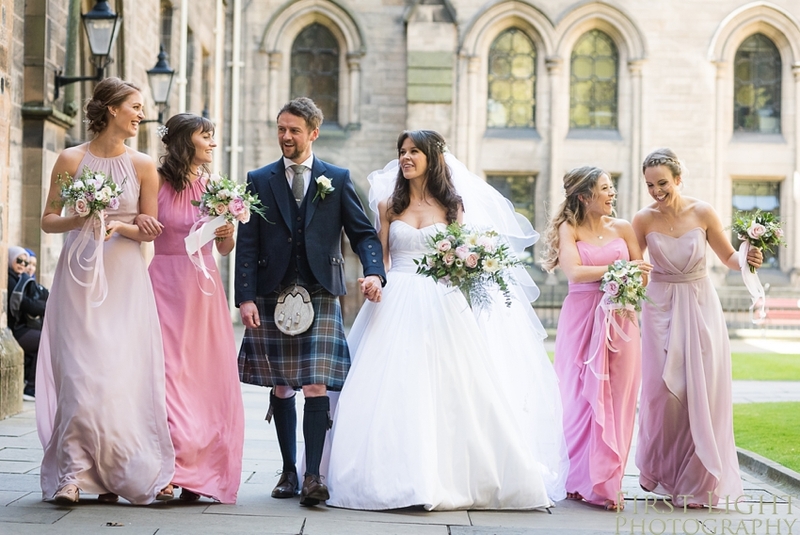 The couple were married in the magnificent surroundings of Glasgow University Chapel, followed by a reception at Lochgreen House Hotel, in Troon. 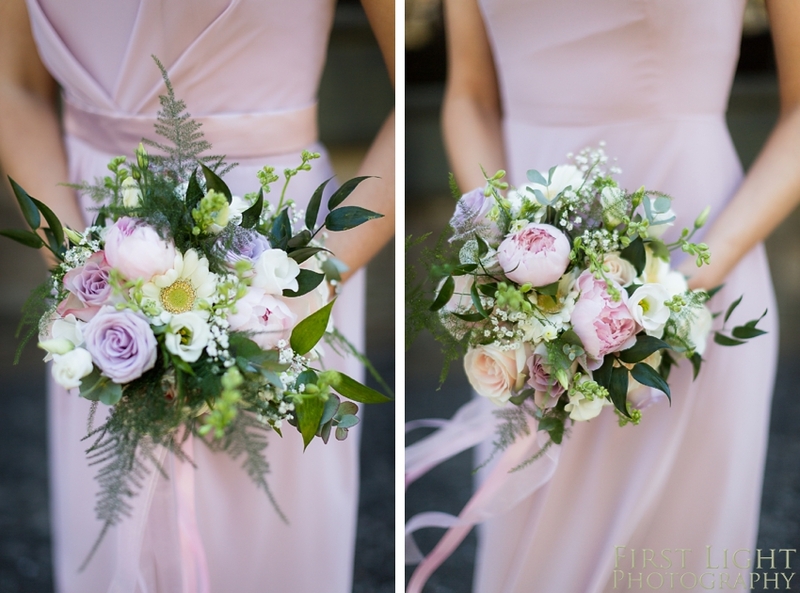 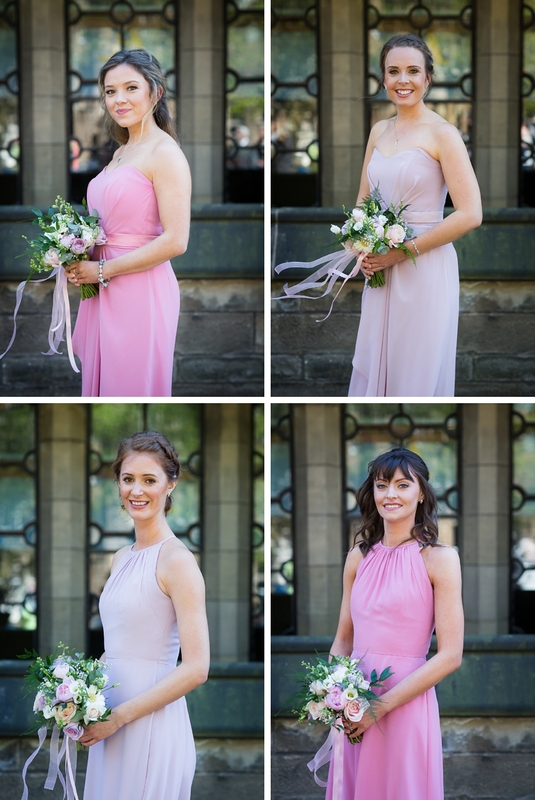 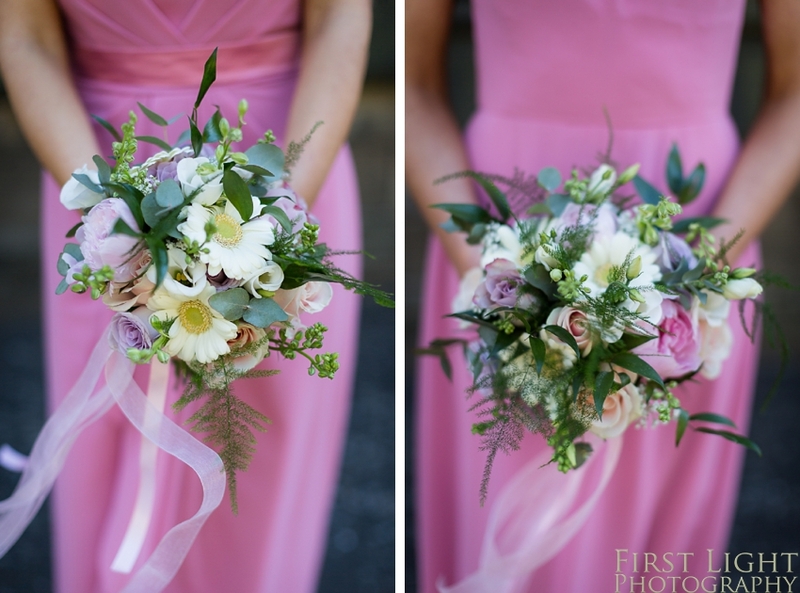 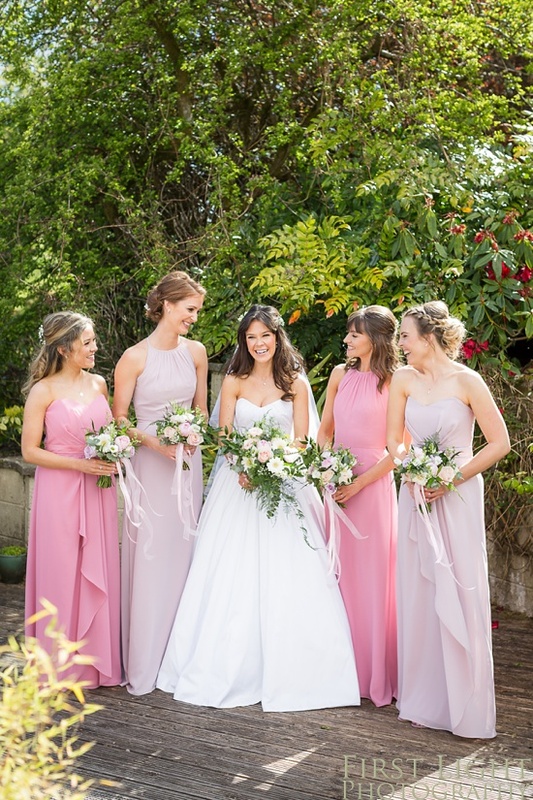 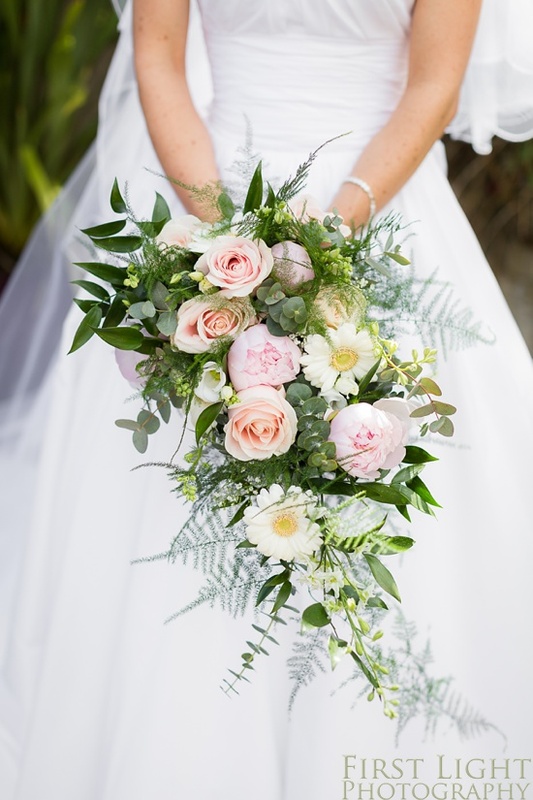 Samantha’s pretty hand tied bouquet, and the posies carried by her four bridesmaids, were made up of blush roses, pale pink peonies and cream gerberas. 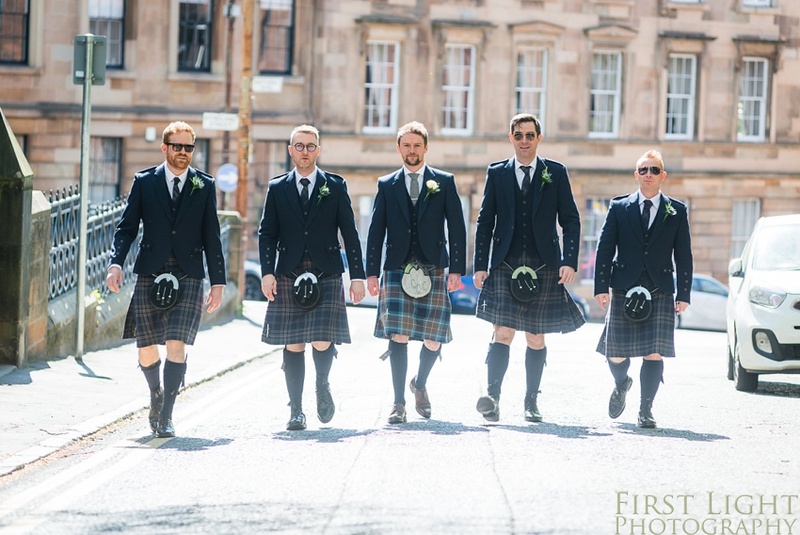 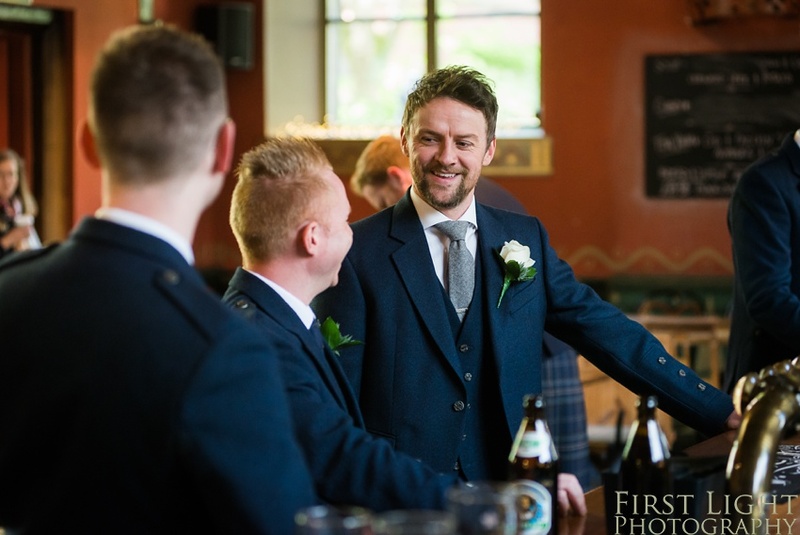 Meanwhile, Michael and his groomsmen enjoyed a drink at Cottiers before heading to the chapel. 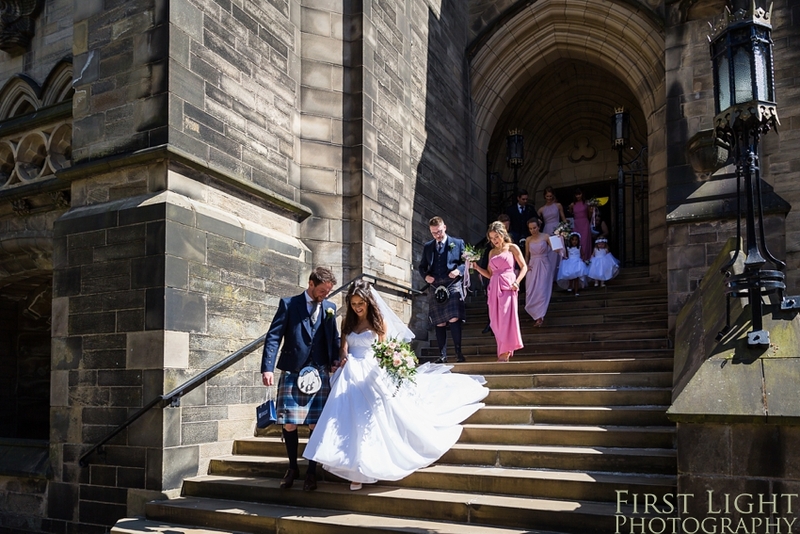 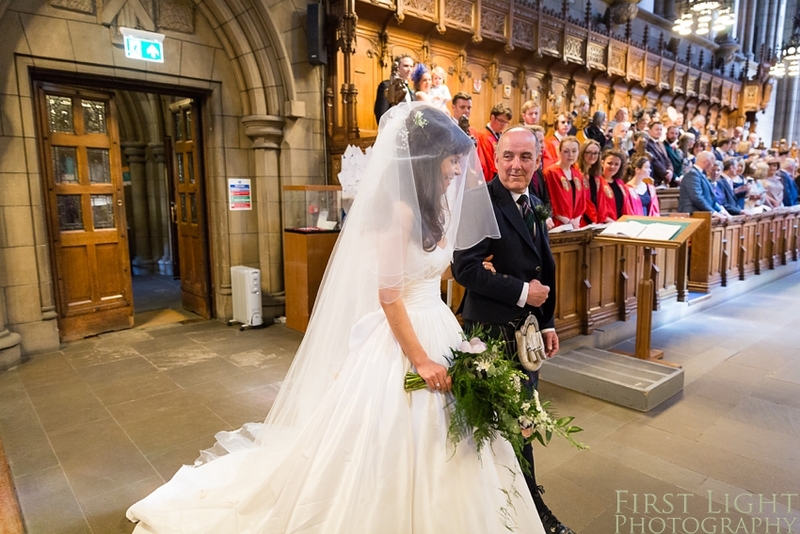 I love this moment of Samantha and her father making their way up the steps to Glasgow University Chapel, a beautiful, traditional landmark in the west end of Glasgow. 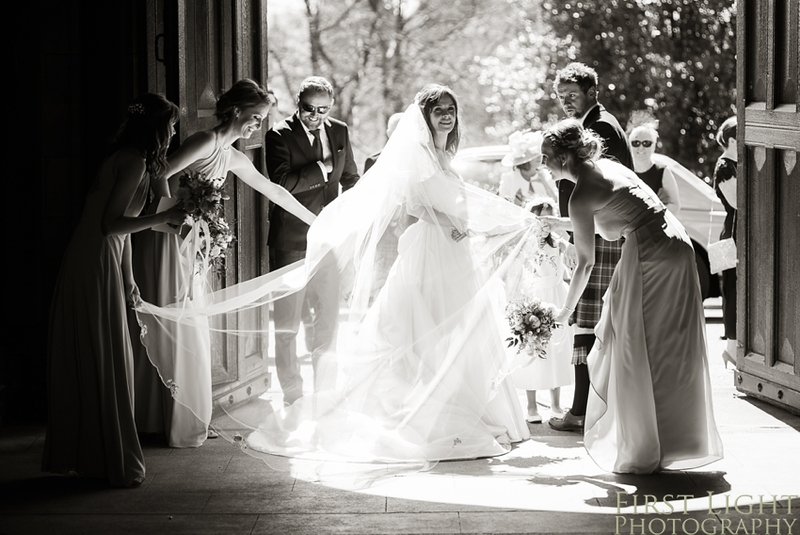 The venue held a special place for the couple, being in the area where they first met and now live. 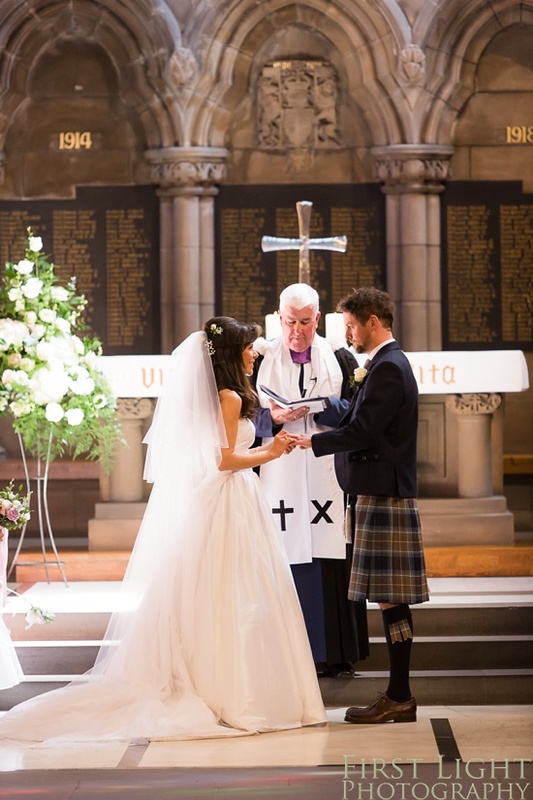 The chapel has many grand and breathtaking elements to it from the beautiful stained glass windows to the original stone and woodwork pieces. 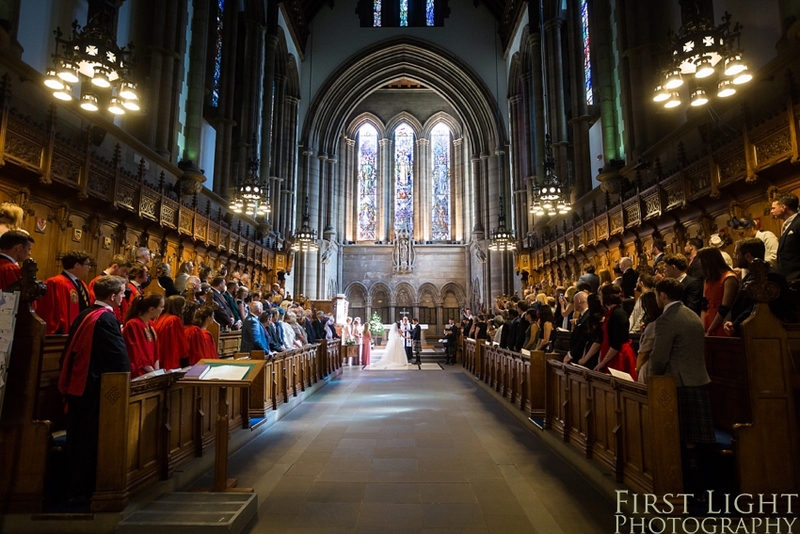 The inward facing pews of the chapel allow all the wedding guests a good view of the ceremony. 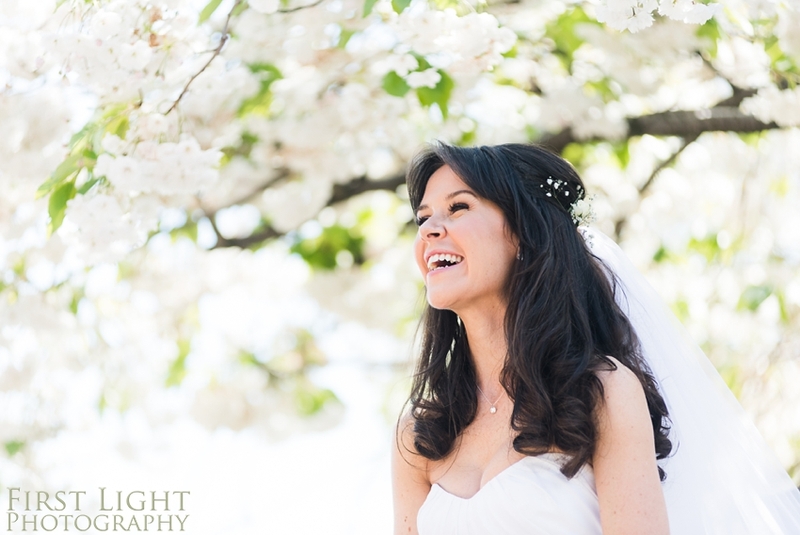 Another joy of a spring wedding is blossom! 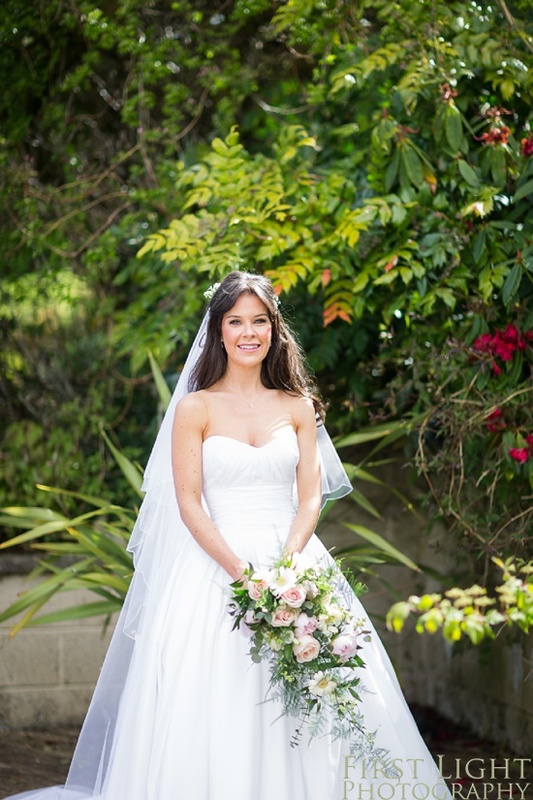 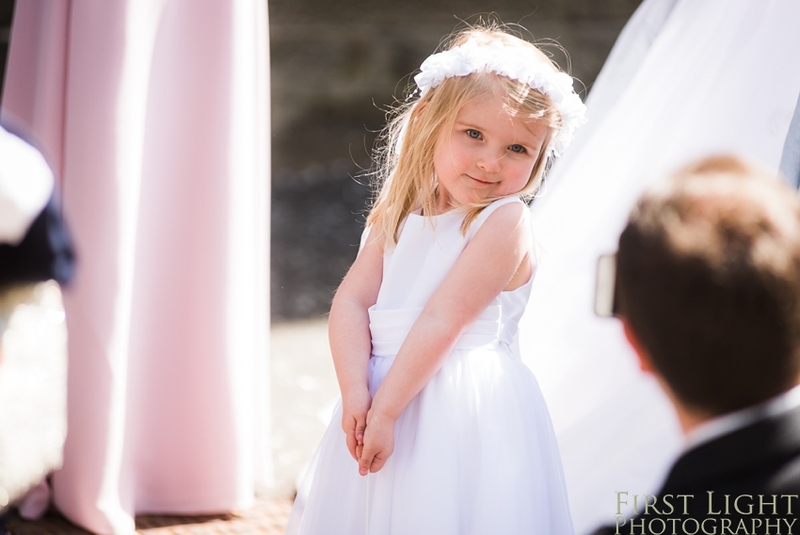 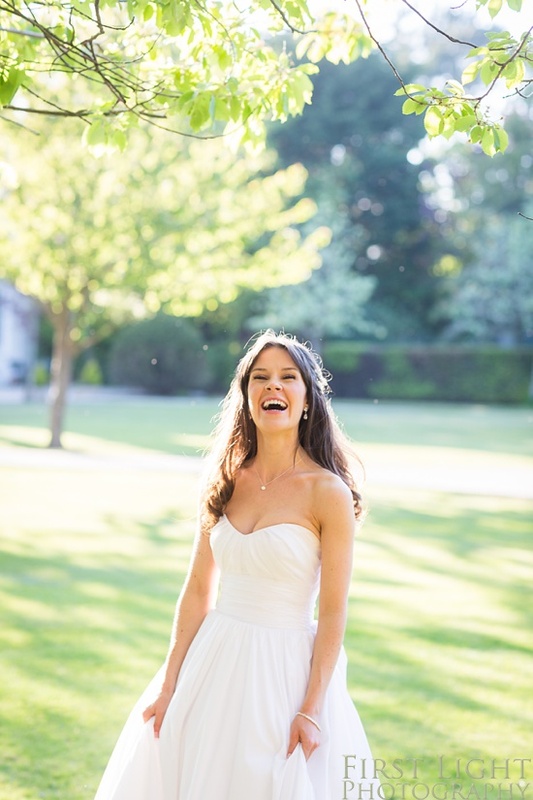 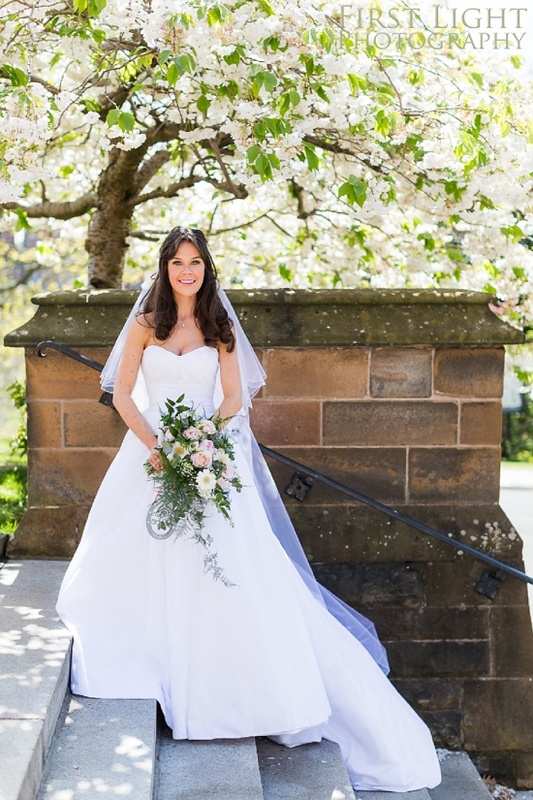 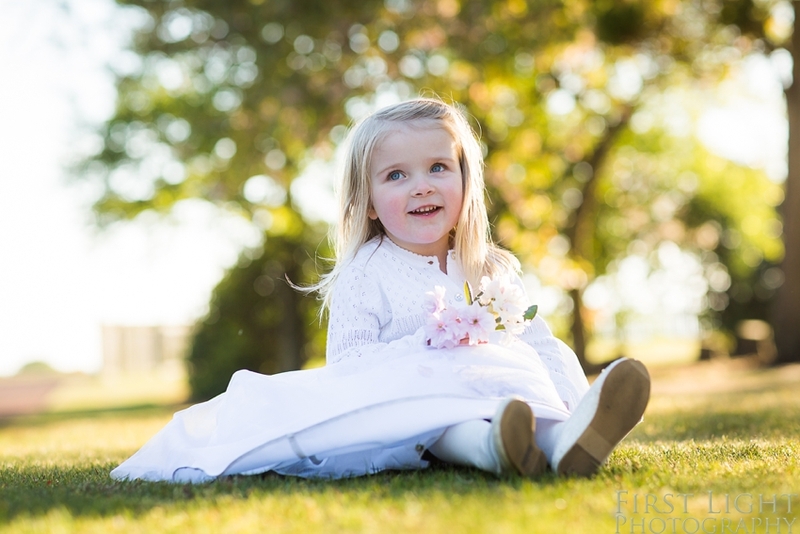 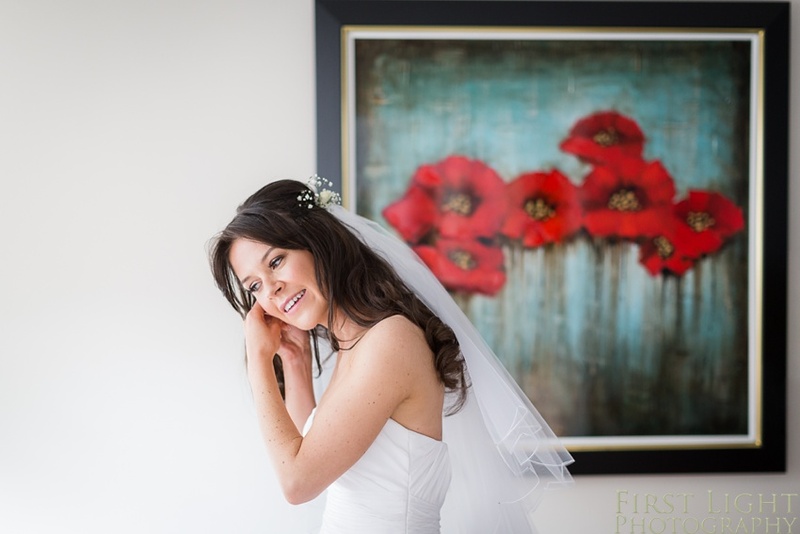 The timing of the wedding perfectly coincided with the blossom trees being in full bloom, providing the most beautiful backdrop for portraits of Samantha. 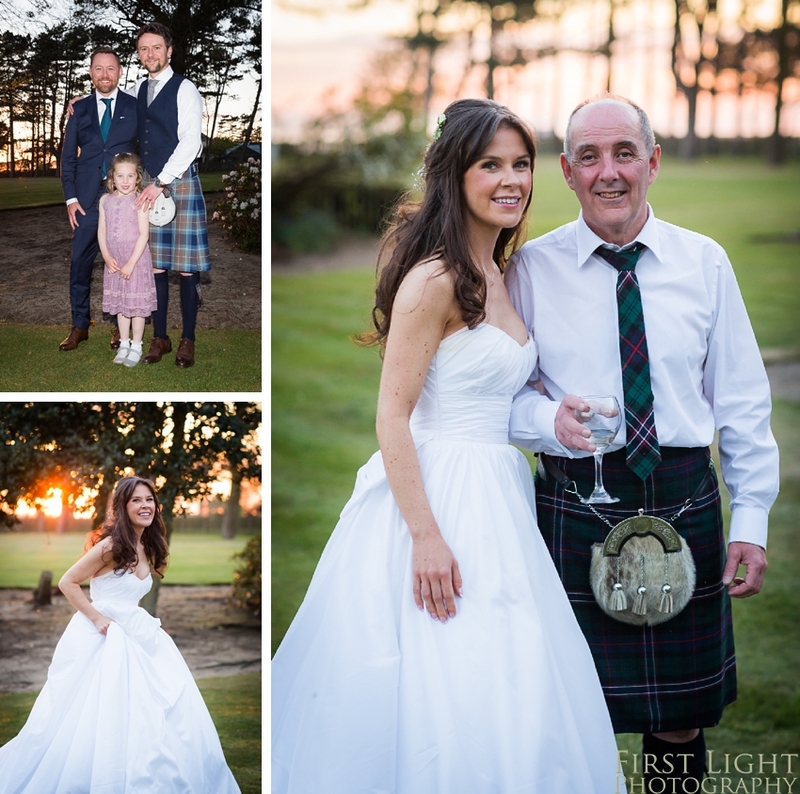 The second venue of the day was Lochgreen House Hotel, which is 45 minutes from Glasgow on the west coast. 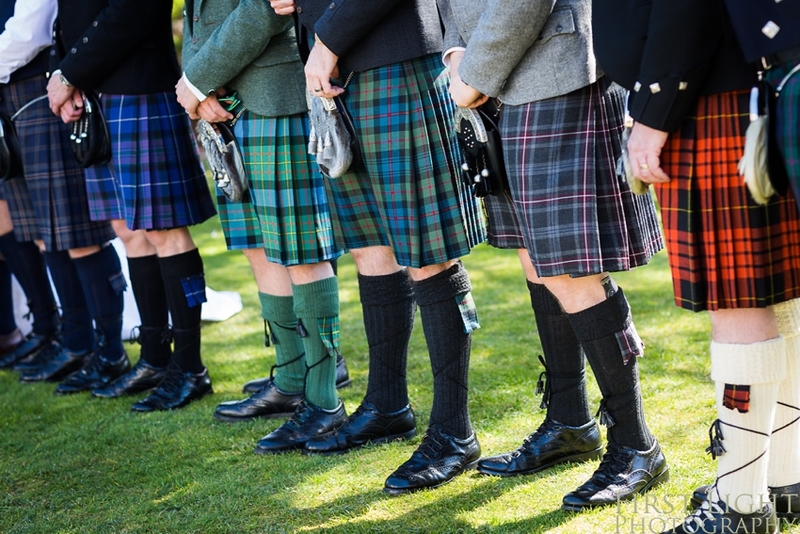 Lochgreen House is a traditional country house which sits in the countryside in the west coast of Scotland. 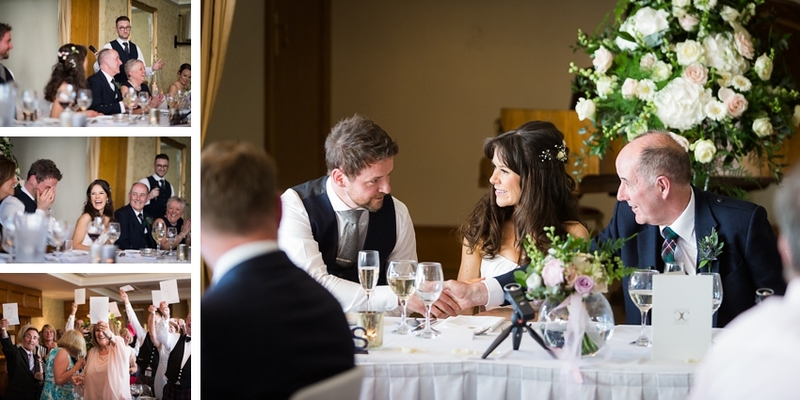 The couple loved the homely but elegant ambience this hotel offers as well as the stunning food and canapés. 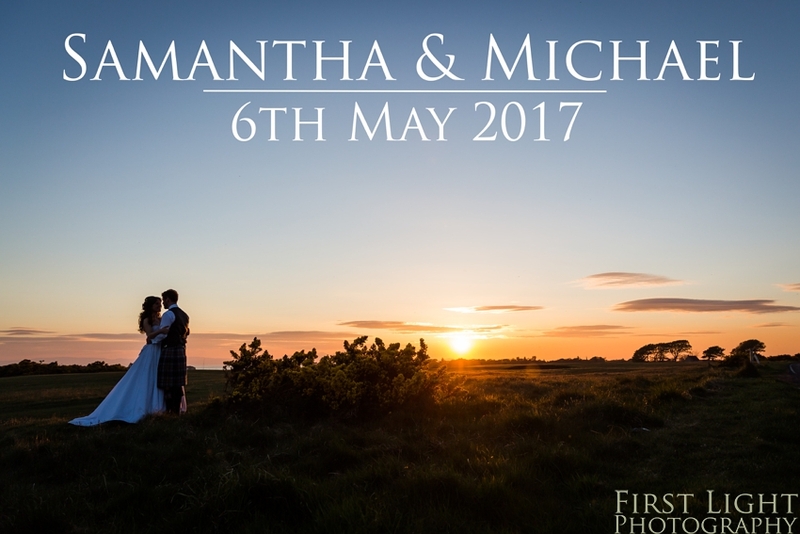 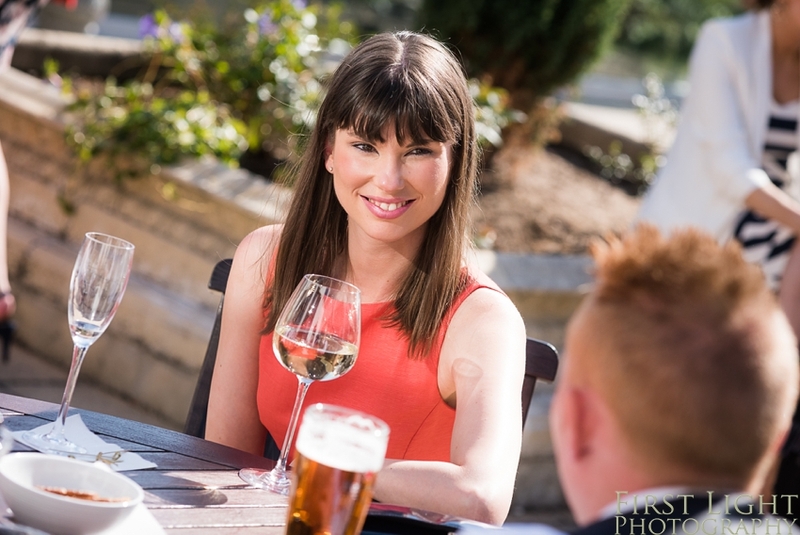 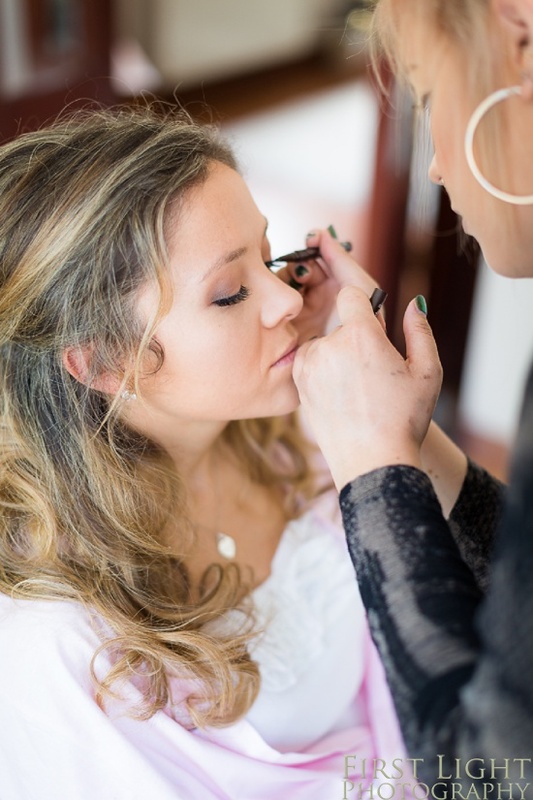 Sam and Mike, we had the most wonderful time capturing your wedding – thank you for choosing us to capture your day!